It’s not all purrs and frolicking here. Not for me, anyway. I knew it wouln’t be easy taking care of 7 kittens and their 2 mothers, but I wasn’t prepared for the smell! In no time flat, the room in which I’m keeping the cats has taken on a pretty icky odor. I’m off work tomorrow, so I’ll spend some time cleaning up in there. I’m sure I’ll discover some hidden surprises. The cats have begun to hang out right by the door, so when I open it to go in to feed, scoop or play, they try to escape. The 2 mothers are the first to slip past. 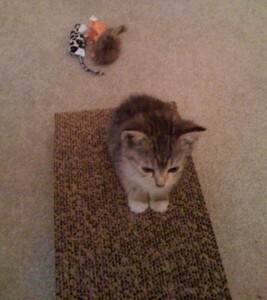 The kittens are easier to herd back into the room because they’re still a little afraid of me. A few have gotten out, and presents a challenge. They head straight for any piece of furniture or appliance they can hide behind. The heavier, the better. I have to plan a strategy for dealing with the escape attempts so nobody’s lost in the house and there aren’t any encounters with my cranky cat. My nephew has been dying to come and help me with them, but he’s been sick and has had to stay home. I hope he’ll feel better soon. If you know anyone in the area who could give any of these cats a great home, let me know. The Animal Advocates of Moore County (AAMC) did a huge favor for me. In February, a cat started hanging around my house. It was pretty cold, and I felt bad for her. I started feeding her and tried to coax her into the house. I finally tricked her into coming into the house on her own. I called AAMC to see if they knew of anyone who was missing their cat. 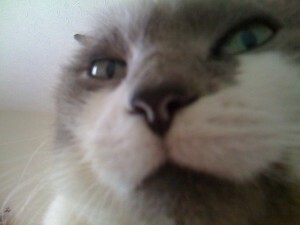 She was extremely sweet and a beautiful cat. Someone came to get her, and she was taken to a vet to be checked over. She was such a great cat that I decided to keep her. About a month after her arrival, Peeps developed paralysis in her back legs. I took her to a few vets to see what could be done for her. They had me convinced that she’d never recover and we’d eventually have to have her euthanized. It was heartbreaking. I emailed AAMC to find out if anyone there had any experience with paralysis in a cat. Barb, from AAMC, actually came to my house and picked her up to take her to their vet! 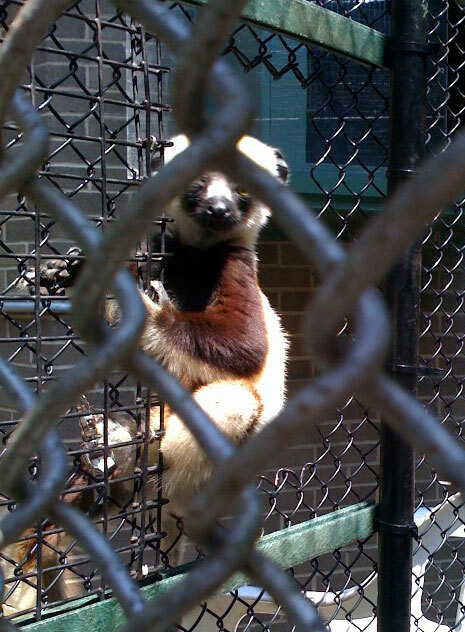 She then kept her for a few weeks while Peeps underwent treatment with steroids (yuck). Peeps was able to walk when she got home! So, I owe AAMC big time. Today I received a couple of mother cats and their litters of kittens. I think there are 7 kittens. I’d have to count to be sure. I’ll keep them here until homes are found for them all. 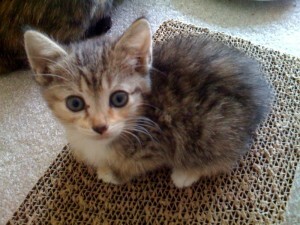 Fostering these cats is the least I can do to try to repay the folks at AAMC. 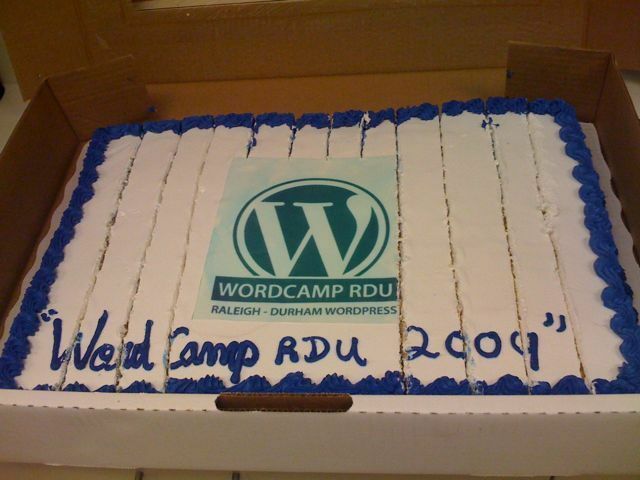 Stop by WordCamp RDU and see us! This was the cake we were served during lunch. Boy, was it good! We met lots of great people. Matt Mullenweg is a charming and entertaining speaker. He made me fall in love with WordPress all over again. 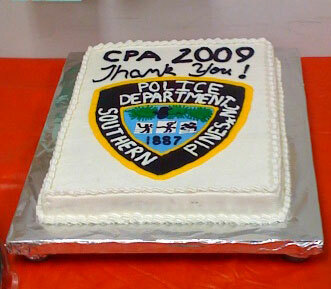 I had the unique opportunity of attending the Southern Pines Police Citizens Police Academy these past 8 weeks. We had our last session this evening. This cake was baked and skillfully decorated by one of the other attendees (Barbee). Here’s more information on Community Oriented Policing. If you own a business or live in Southern Pines, sign up for the next Southern Pines Police Citizens Police Academy. It’s an amazing program. Ask your local police department if they offer something similar. I’ll catch up on more posts in the next few days. Tomorrow’s Friday! A blog reader sent this to me, and I wanted to pass it on. I follow your blog and thought you might be interested to know about a new initiative launched by a coalition of patient advocacy organizations during the American Society of Clinical Oncology (ASCO). Led by the International Myeloma Foundation (IMF), MDS Foundation and the Tackle Myeloma Foundation (TMF), they unveiled a patient “Statement of Principles” to address the inequalities in reimbursement of cancer therapies. Currently, Medicare and private insurance companies require higher deductibles and co-payments for oral drugs than for IV therapies and inpatient procedures. However, private insurance is regulated at the state level and Oregon, Indiana and Iowa have laws requiring equal coverage with similar legislation pending in several additional states and federal legislation introduced in Congress. If you’re interested in learning more or signing the petition, you can check out the IMF or MDSF websites. If you go to the IMF’s web site, you can read more about the Cancer Patient Statement of Principles. This was taken from their web site. Click here to support the Cancer Patient Statement of Principles.